When EPA issued its All Appropriate Inquiries rule in 2005 and ASTM followed with the E1527-05 Phase I ESA Standard, greater clarity was brought to the site assessment market for both property owners and environmental professionals. These two documents spelled out the steps needed to obtain a CERCLA liability defense. However, with this clarity came additional confusion: how does a property owner maintain their CERCLA protection after the Phase I has been completed? According to language written by Congress, CERCLA libaility protection begins with AAI, but may also require "continuing obligations" without saying much more about what that might entail. After several years of drafting and debate, ASTM issued the E2790 Standard Guide for Identifying and Complying with Continuing Obligations in July. What does the standard entail? How will it change your practice? Should prpoerty owners and lenders be concerned? How should it be applied to real-life scenarios? 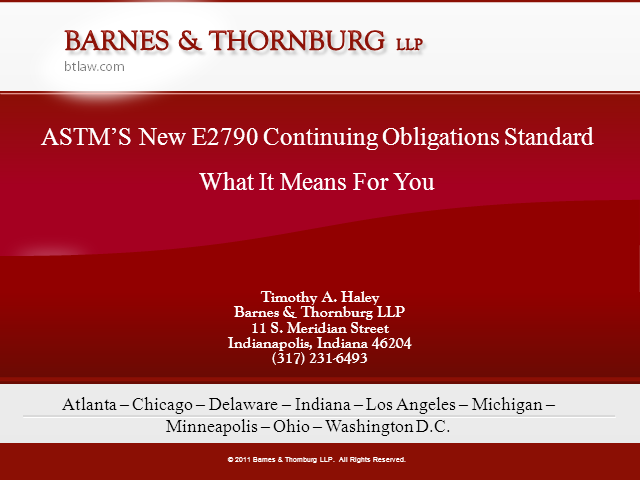 Attorney Tim Haley of Barnes & Thornburg will answer all of these questions and more during a free webinar on October 6, 2011 at 2pm EST. Tim is not only an experienced environmental attorney, but also contributed to writing the E2790 Standard. commonground is the award winning social network and business information resource for environmental and commercial real estate professionals, including EP’s, engineers, lenders, attorneys, health and safety, insurance providers, appraisers, state and local government and industry leaders. This channel brings the latest updates and critical business information from industry leaders directly to our members..